Aims: To report a case series of enophthalmic patients with lagophthalmos. Methods: A retrospective review of the electronic medical records at a tertiary health care centre of all patients with the diagnoses of “enophthalmos” and “lagophthalmos”. Patients who had a history of diseases (such as Graves’ orbitopathy), trauma or surgery of the orbit and eyelid were excluded. Enophthalmos was defined as exophthalmometric reading of 14 mm or less in both eyes. Results: Seven patients (14 eyes) with bilateral enophthalmos were found to have concomitant lagophthalmos. All patients had deep superior sulci bilaterally. The upper eyelids were seen to be severely retro-placed behind the superior orbital rim. The extraocular motilities were full with no focal neurological deficit. The orbicularis oculi function was normal with no facial paralysis. The orbits were soft on retropulsion and no facial asymmetry was noted. The mean exophthalmolmetry reading measured 12.6 (SD 1.1) mm. The lagophthalmos varied from 1–5 mm. One patient (one eye) with 3 mm lagophthalmos developed a corneal ulcer and was treated with topical antibiotics and gold weight placement in the upper eyelid. Conclusion: Enophthalmic patients with deep superior sulci and retro-placed upper eyelids may present with lagophthalmos and exposure keratopathy. It is well known that proptosis may be associated with lagophthalmos due to relative shortness of the eyelids to cover the protruding globe. However, the association between lagophthalmos and enophthalmos has not been reported. We report a case series of seven patients (14 eyes) with these unusual concurrent findings. We reviewed the orbito-facial electronic records of 5934 patients at the Jules Stein Eye Institute, UCLA School of Medicine, using an in-house computer program. Patients with the diagnoses of “enophthalmos” and “lagophthalmos” were identified and the data analysed. We defined enophthalmos as an exophthalmometric reading of 14 mm or less in both eyes. Thirty one patients had the concomitant diagnoses of enophthalmos and lagophthalmos after excluding those with anophthalmic sockets. Of these 31 patients, only seven patients (14 eyes) fulfilled the study criteria of not having a history of diseases, trauma, or surgery to the eyelid and orbit. We also excluded patients with facial paresis or neurological disorders. The demographics of the patients are given in table 1. The patients were elderly with a mean age of 69 years (range 55–82). The average Hertel exophthalmometer reading was 12.6 (SD 1.4) mm. The orbital and neurological examinations were normal with full ocular motility. A deep superior sulcus defect was noted bilaterally in all patients and the upper eyelid was found to be retro-placed behind the superior orbital rim. Representative illustrations of the patients are shown in figures 1 and 2. All patients had symptoms of ocular surface irritation including foreign body sensation, eye redness, pain, and tearing. The lagophthalmos ranged from 1 to 5 mm but the corneas were compensated in most of the study eyes and were treated conservatively with ocular lubricants. One patient (patient 3) had severe right corneal ulceration that was treated with gold weight placement in the upper eyelid and lateral tarsorrhaphy. The orbicularis function was good in all eyes and there were adequate anterior lamellae in the upper and lower eyelids. 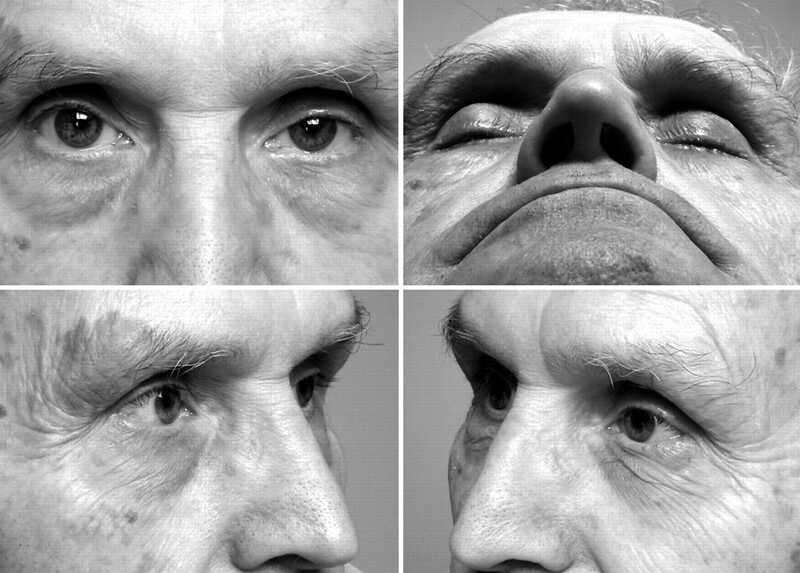 Atrophy or loss of orbital and periorbital fat is an ageing process. This is often evident clinically as a deep superior sulcus defect and may result in enophthalmos.1 Orbital fat atrophy has been associated with other secondary causes such as orbital varix, orbital irradiation, scleroderma,1 and hemifacial atrophy.2 The absence of a secondary cause, normal orbital examination, and bilaterality in our patients make age related loss of orbital fat a likely cause of the enophthalmos. We are not aware of any literature on the incidence of lagophthalmos in patients with senile enophthalmos. It is intriguing that lagophthalmos can occur in enophthalmic eyes. The severity of lagophthalmos seemed to worsen with the degree of enophthalmos, although a direct relation cannot be derived from this small series. We postulate that the loss of orbital fat causes a portion of the upper eyelid skin to retract into the deep superior sulcus, decreasing the eyelid cord length and thus functionally diminishing the anterior lamella. In fact, we observed clinically that the upper eyelid lies in a plane posterior to the superior orbital rim and is therefore retro-placed. In addition, we postulated that the preseptal orbicularis oculi is reflected into the deep superior sulcus so that the course of the muscle becomes V-shaped with its inflexion point in the deep orbit (fig 3). Contraction of this abnormally configured muscle results in a force vector directing posteriorly above the inflexion point and another vector directing anteriorly below the inflexion point with a resultant diminution of its contractile function. The posteriorly directed contraction vector may contribute towards incomplete eyelid closure. While the pre-tarsal orbicularis oculi is important in blinking, the posterior directed contractile force of the pre-septal orbicularis works against the pretarsal component during blinking. In a normal upper eyelid with an anteriorly vaulted orbicularis, the force of muscle contraction is directed inferiorly to close the eye. Further high resolution imaging of the upper eyelid with surface coils3 is helpful to validate our postulations. Cross section of an enophthalmic eye showing the pre-septal orbicularis oculi reflected posteriorly with its inflexion point (asterisk) deep in the superior sulcus. Cline RA, Rootman J. Enophthalmos: a clinical review. Ophthalmology 1984;91:229–37. Aracena T, Roca FP, Barragan M. Progressive hemifacial atrophy (Parry-Romberg syndrome): report of two cases. Ann Ophthalmol 1979;11:953–8. Goldberg RA, Wu JC, Jesmanowicz A, Hyde JS. Eyelid anatomy revisited. Dynamic high-resolution magnetic resonance images of Whitnall’s ligament and upper eyelid structures with the use of a surface coil. 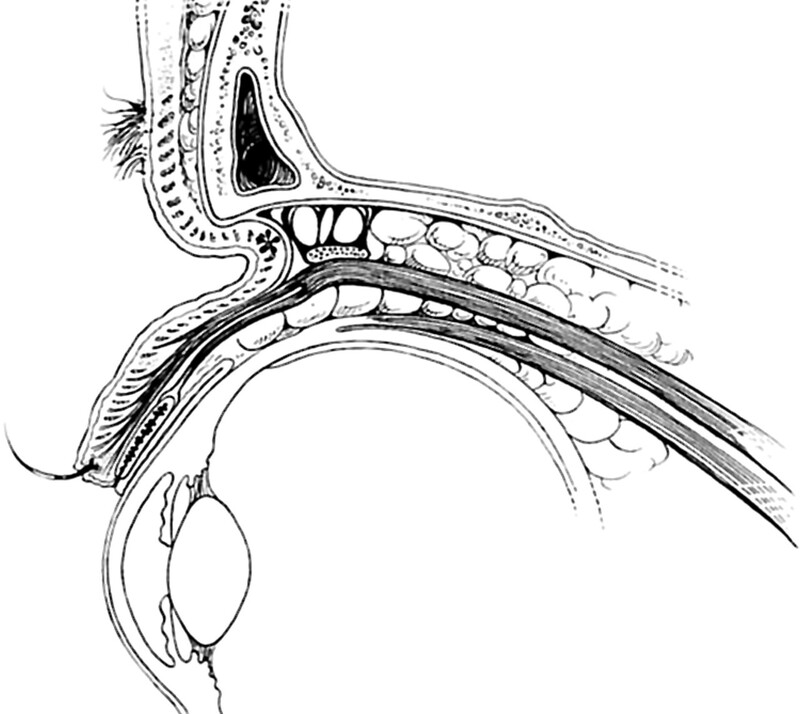 Arch Ophthalmol 1992;110:1598–600. Rose GE, Collin R. Dermofat grafts to the extraconal orbital space. Br J Ophthalmol 1992;76:408–11.